The K4 Premium Full Control Home comes with a five year warranty. 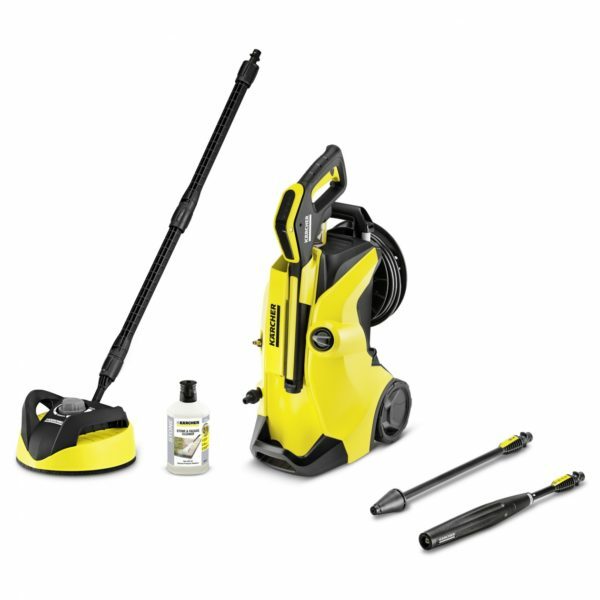 The addition of a hose reel and the home kit make cleaning around your home easier than ever. If you require further assistance please call our office on 01473 636663. The new Kärcher K4 Premium Full Control jet washer is a great addition for your home. This premium model comes with a hose reel on the back of the unit, this makes winding and unwinding your high-pressure hose even easier, helping to prevent kinks in the hose. When combined with the hose guidance system, this helps to create an extremely stable unit. With the Quick Connect hose system, setting up and packing away your pressure washer has never been easier. This model also comes with an extra long warranty of five years, giving you two years extra warranty than the non-premium models. The additional home kit makes cleaning your larger patio and decking areas even easier. Helping you finish up to five times quicker than using a standard spray lance. While the stone detergent helps to clean, care and protect your stone surfaces. The new full control system helps you achieve the best possible clean. The spray lances guide you to the correct lance via their symbols. If you choose the vario spray lance, you can then select the right pressure setting, using the LED display on the full control trigger gun to guide you, helping achieve the best possible clean for your home. Quick and easy application of detergents through the pressure washer, when in detergent mode. The Plug and Clean detergent can be replaced quickly and easily with one simple movement. The Full Control trigger gun is easily accessible. After you have finished, the Full Control trigger gun and spray lances can be stored on the pressure washer to save space.